There is a family of plants falling into the noxious weed category in Colorado. They are found in the Double El Conservation District and Agate CD. As a noxious weed, these plants have negative impacts on the land, animals and people. The three knapweeds on the noxious weed list are Diffuse knapweed, Russian knapweed and Spotted knapweed. It is important to know which knapweed you are dealing with as the best control methods vary by species. The descriptions of the plants and control methods are taken from the El Paso County Community Services Department Environmental Division booklet, “Noxious Weeds and Control Methods”. A tap-rooted plant that usually grows as a biennial. It reproduces by seeds only, and is capable of producing 18,000 seeds per plant. Following seed production, the plant dries out and often takes the form of a tumbleweed, spreading seeds great distances. Flowers: Usually white, sometimes lavender; spiny bracts with a distinct central spine and fringed comb-like edges. Leaves: Finely divided, become reduced as plant matures. Flowers: Pink to purple, urn-shaped, and solitary at the ends of upper branches, pointed papery tips on rounded bracts. Stems: Upright, branched, covered in short stiff hairs. Roots: Horizontal, vigorous, and black with a scaly appearance. A short-lived perennial that reproduces only by seed. Each plant is capable of producing up to 40,000 seeds. It tends to invade disturbed / overgrazed areas, but can tolerate both dry conditions and high moisture areas. Flower: Urn-shaped, pink to purple, usually single at the end of branches; black- tipped (“spotted”) spiny bracts. Leaves: Small, oblong, pinnately divided. Knowing the weeds present and how to best treat them is important. The El Paso County Community Services Department Environmental Division booklet, “Noxious Weeds and Control Methods” is an excellent first step. For assistance, contact NRCS in Simla at (719)541-2358 or Contact Us online. *Featured image of Spotted Knapweed for post courtesy of USDA Plant Database & photographer Larry Alain. Insects listed below provide good control when used together, but may take 3 to 5 years to establish and achieve optimum results. Root weevil – Cyphocleonus achates. Sever the taproot below ground while still in rosette stage. 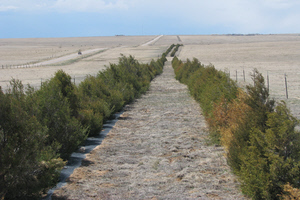 Mowing is effective at full-boom. Plant parts must be disposed of properly as seed may still develop on cut plants. Mow several times before plants bolt. Most effective when combined with fall herbicide treatment. Aminopyralid: Apply in early spring at the rosette to early bolt stage and/or in the fall to the rosettes. 2,4-D Amine: Can be applied to spring or fall rosettes. Clopyralid + Triclopyr: Apply in early spring at the rosette to early bolt stage and/or in the fall to the rosettes. Picloram: Apply in early spring at the rosette to mid-bolt stage and /or in the fall to the rosettes. Chlorsulfuron: Apply in early spring at the rosette to early bolt stage and/or in the fall to the rosettes.